Powers/Abilities: The God of Serpents is a powerful demon that even Dr. Strange could only banish when it was weakened, distracted. It could be magically summoned to Earth and controlled while within a pentagram, but could turn on its master if he/she/it entered the pentagram. It could swallow a human whole. 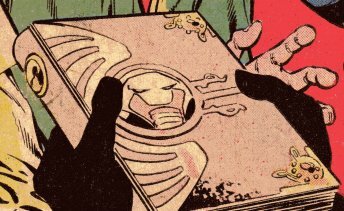 (Spectacular Spider-Man Annual#9 - BTS / Daredevil Annual#4B (fb) - BTS) - Tyrannus coerced Cloak into obtaining the sacred Book of Kell (an ancient text of the "Sons of the Serpent cult"), which was overflowing with timeworn incantations, including one to summon the Snake God. (Daredevil Annual#4B) - Though seemingly allied with Viper, Ghaur, and others to resurrect Set, Tyrannus secretly sought power for himself. Using the sacred Book of Kell, Tyrannus sought to summon Set and enslave him for his own purposes. 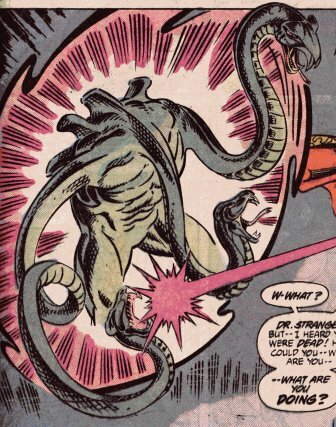 When Viper came to his Monroe Falls, New York base, Tyrannus used his telepathic powers (enhanced by his bond to el Dorado's Sacred Flame of Life) to mesmerize her, and then he set her up to be a sacrifice to the serpent god. Tyrannus recited the spell before a large pentagram, a mystic portal opened, and a three snake-headed monstrosity emerged, ready to consume his helpless sacrifice and perhaps grant a boon of power to his summoner. Drawn of Monroe Falls by the dark magical forces at work there, Dr. Strange arrived in time to hold off the Snake God with a series of magical bolts. Recognizing the creature as a fiend from Dormammu's dimension, a monstrosity from the outer darkness, Dr. Strange strove to warn Tyrannus of the danger he was in. Tyrannus cared little what he had summoned, noting that as long as it remained bound by the pentagram, demon or deity, it was his to command. Focusing all of his Flame of Life-enhanced psychic power, Tyrannus managed to gain control of the demon; however, in thus focusing his full power, Tyrannus allowed his control over the Viper to lapse, and she threw an elbow into his LOWER abdomen and then cast him into the pentagram. No longer under Tyrannus' control, the Snake God swiftly devoured him, swallowing him hole. As the monster fed, its defenses were lowered, and Dr. Strange called upon Hoggoth and the strands of fate to banish the Snake God back through the still open portal to its dark domain and to let white light seal the gate. Comments: Created by by Gerry Conway, Mark Bagley, Sam De La Rosa. "The Outer Dark" often refers to the extradimensional realms inhabited by the Old Ones, though it could refer to any extradimensional realm. The Dark Dimension is an amalgamation of pocket realms annexed by Dormammu and Olnar. It would seem quite reasonable that either Dormammu or Olnar annexed a pocket realm associated with the Outer Dark. Are there good, unused Lovecraftian names for serpent gods? Bokrug (The Great Water Lizard) first appeared in Lovecraft's short story "The Doom That Came to Sarnath" (1920). The being is also part of Lovecraft's Dream Cycle. Bokrug is the god of the semi-amphibian Thuum'ha of Ib in the land of Mnar. The deity slept beneath the calm waters of a lake that bordered Ib and the city of Sarnath. Mnomquah (the Lord of the Black Lake) is first referenced in Brian Lumley's short story "The Sorcerer's Book" (1984). Mnomquah is trapped inside the Dreamlands' moon, though how he became imprisoned there is not known. He appears as a vast reptile with a crown of snaking feelers and empty sockets in place of eyes (though they still serve as sensory organs). His mate is the repulsive Oorn. It is said that when the other Great Old Ones return to lay waste to the world, Mnomquah will be reunited with his bride. Yig (the Father of Serpents) is a deity that appears as a serpent man or as a giant snake. Although Yig is easy to anger, he is easy to placate as well. Yig often sends his serpent minions, the children of Yig, to destroy or transform his enemies. The info comes from a great web site called the Cthulhu Files and taken from information gathered from that site by web site author Joseph Morales. I was hoping you would only use the most pertinent info from what I gave you. As for Yig, this god is a corruption of the god Quetzecoatl and worshipped by native tribes of North America.
" Mnomquah (the Lord of the Black Lake) is first referenced in Brian Lumley's short story "The Sorcerer's Book" (1984). " Me likey. I especially like the idea that the Book of Kell was used to summon Yig, but that in this case one of his children, "Yiggorum," was sent. The name Yiggorum became offficial in the Demons entry in OHOTMU A-Z Hardcover #3. The Sacred Book of Kell is an ancient text of the "Sons of the Serpent" cult. In recent years, Tyrannus learned of the tome and its secrets to great power from his follower Elton (possibly a follower of Set, possibly one of the Snake Men, or possibly one of the Sligguth-spawned Serpent Men). Via the power of El Dorado's Sacred Flame of Life, Tyrannus mesmerized the vigilante Cloak and sent him to obtain the Book of Kell from a Parisian museum. Cloak returned soon after, and Tyrannus rewarded Cloak by instructing his Snake Men servants to kill him quickly. Cloak grabbed his partner, Dagger, and fled. From his base in Monroe Falls, New York, Tyrannus sought to use the sacred Book of Kell to summon Set and enslave him for his own purposes. When Viper came to his Monroe Falls, New York base, Tyrannus mesmerized her, then set her up to be a sacrifice to Set. Tyrannus recited the spell before a large pentagram, a mystic portal opened, and a three snake-headed monstrosity emerged, a fiend from Dormammu's dimension, a monstrosity from the outer darkness. While Tyrannus struggled to control the demon, his control over Viper relaxed, and she cast him into the pentagram, where the Snake God devoured him whole. Dr. Strange, drawn of Monroe Falls by the dark magical forces at work there, banished the Snake God back through the still open portal to its dark domain and to let white light seal the gate. The Book of Kell was "overflowing with timeworn incantations, including one to summon the Snake God."